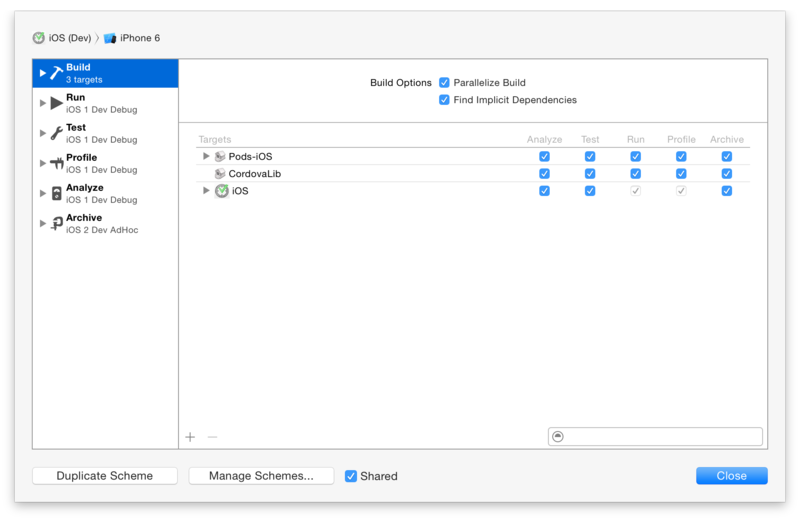 I have an iOS/OS X Xcode projects, where I'm using CocoaPods, and I can't seem to figure out how to add my own project configurations (In addition to Debug and Release) without completely blowing up the build. In the project, I have a number of targets, for apps on both platforms and its app extensions. The Xcode workspace of course also has the Pods project. Now here's where I have a problem. So far I've had only the default "Debug" and "Release" configurations in my project. I wanted to change them and add some new ones for different provisioning profile/bundle ID combination. … and I'm stuck. I can't figure out how to do this. [!] CocoaPods did not set the base configuration of your project because your project already has a custom config set. In order for CocoaPods integration to work at all, please either set the base configurations of the target NozbeToday to Pods/Target Support Files/Pods-iOS/Pods-iOS.dev debug.xcconfig or include the Pods/Target Support Files/Pods-iOS/Pods-iOS.dev debug.xcconfig in your build configuration. Essentially, you have to add an explicit dependency on the Pods target to your application scheme. Click on the project in project navigator, and select the project itself (not one of targets). Go to Info, and under Configurations set the right .xcconfigs to each configuration and target in the "Based on Configuration file" column. Not the answer you're looking for? Browse other questions tagged ios objective-c xcode cocoapods or ask your own question.